This is ironic considering that ultimately this popular ‘Fifties flick proved to be an influence on flicks such as Spielberg’s Jaws, Predator and Alien itself in the first place. 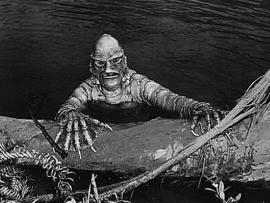 However watching the original Black & White movie one wonders whether the world actually needs yet another Alien clone, or even a Creature of the Black Lagoon remake for that matter. To recap: Creature of the Black Lagoon will start filming as soon as director Eisner wraps up yet another remake, this time of George Romero’s 1970s disease-turning- people-crazy thriller, The Crazies. Budget is said to be $90 million and Bill Paxton is “rumored” to star in it. (Don’t bet on it though.) Filming will be on location in the Amazon. “There's this place called the Forest of Mirrors, because there are so many lagoons on a thousand mile green carpet river, and we found the lagoon we're going to shoot in.” The creature itself has been redesigned, a process that took the film-makers a whole six months. In the original film a scientist discovers a fossilized hand in the Amazon that seems to belong to some unknown species of creature. The hand is webbed and appears to be almost human. The scientist brings in some scientists to look for the rest of the remains. The new team doesn’t find anything, but it seems that something even “better” is out there: a live specimen of a hitherto unknown humanoid amphibian creature. Only problem is that this creature doesn’t take too kindly to crowds of people camping in what must literally be his backyard and it starts killing them off one by one. The creature (known as “the gill-man”) also takes an unhealthy liking to the only female member of the scientific expedition just as any warm-blooded, er, amphibian would . . .
"There is a little bit of the gill-man in all of us. That is, if you’re a hermit amphibian pervert . . ."